Work to Play soccer players from Bateman Elementary took a trip up to Winnetka for a special Saturday Crosstown Classic with students from North Shore Country Day School (NSCDS). 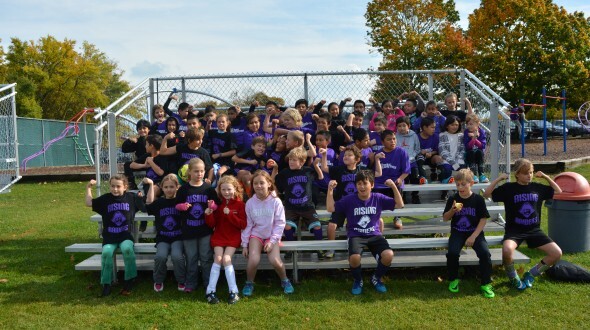 NSCDS hosted a beautiful game day filled with music, tons of fun, and lots of soccer. Eight teams of players, consisting of combined groups of NSCDS and Bateman students, took the field, giving everyone the opportunity to make new friends and learn from each other. 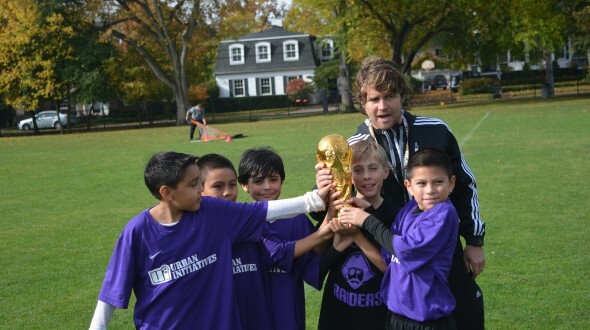 Coach Kyle Jones from NSCDS underscored soccer’s global perspective by giving each team the name of a World Cup participant country: Mexico, Brazil, Japan, Ivory Coast, England, and the US, to name a few. After ten minutes of soccer, the clouds grew heavy, and everyone rushed into the gym as a downpour ensued. Fifteen minutes later, all the players and families came back onto the field, slightly soaked but all the more ready to get down to serious soccer business. 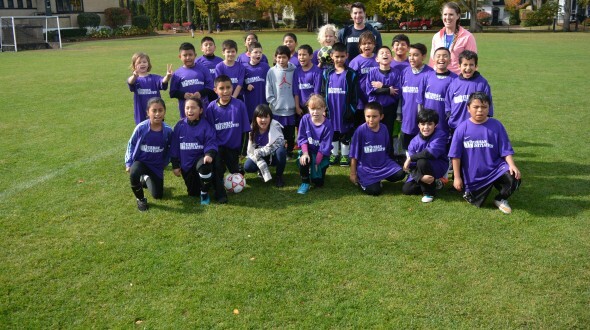 There were plenty of high-fives, jokes, and goal scoring dances on display from the Bateman and NSCDS soccer players. 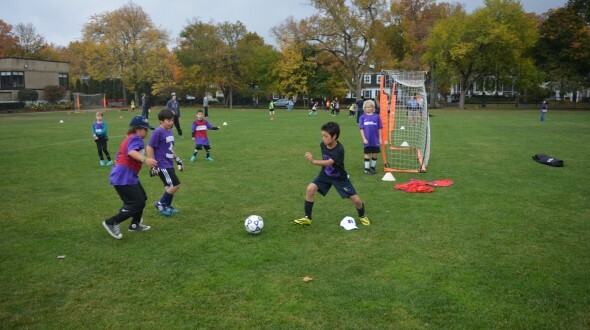 Parents cheered from the sidelines, and volunteers from NSCDS’s boys varsity soccer team kept the players on their toes as they refereed the games. After four rounds of games, the tournament ended with eight teams of winning players. Coach Jones brought out a special surprise with a replica World Cup trophy that all the kids got the chance to hoist into the air. If the replica is any indication, the World Cup is a weighty piece of metal. The players posed for pictures with their teams and then satisfied their appetites with a pizza picnic. It was the perfect way to conclude an amazing day. Urban Initiatives would like to thank North Shore Country Day School for hosting another amazing Crosstown, Coach Jones for organizing an amazing day, the Fortier family for all their support around the event, and the entire NSCDS community for rallying around our players and their families. We’re looking forward to the next one!